For several years now, I have been growing milkweed for monarchs. Each year I delight in discovering adorable little monarch caterpillars munching away at leaves. Then I am heartbroken when the little guys vanish. While I know some probably crawl off to form chrysalises, I’m also aware that some fall victim to predators, like birds or garden spiders. But as luck would have it, I happened across a butterfly tower at a rummage sale and thought it would be the answer to my missing caterpillars. This butterfly tower was basically just a mesh tube, with a circle of cardboard at the top and a circle of cardboard at the bottom. It was intended to be hung from three strings that came to a loop at the top. From the instructions that came along with it, the cardboard ends and the thin strings it hung from, I quickly realized it was intended more for indoor/classroom use. While I thought this was a wonderful teaching tool for children to learn about metamorphosis, this butterfly tower did not meet my needs. So I decided to make my own, one that would be durable enough for outdoor use. The simply design is constructed out of nothing more than an empty hanging basket, mesh, an embroidery hoop and potted milkweed plants. 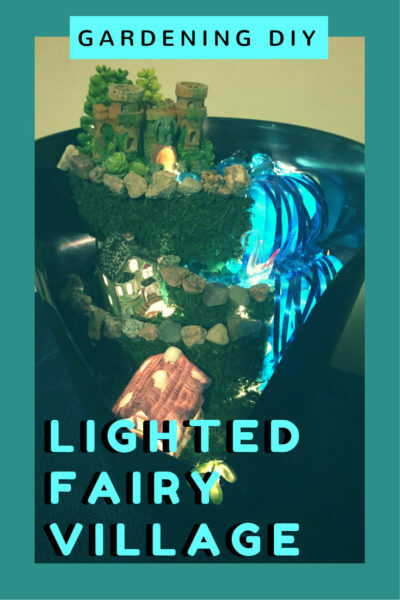 Below you will find more information on how to create your own butterfly tower to protect these beneficial creatures. Remove the wire hanger and thoroughly clean the hanging basket with water and a little bleach. Allow this to air dry. Then reattach the wire hanger upside down so it looks like a bell. Next, cut a small square or circle of mesh to place on the inside of the pot to cover the drainage holes so your caterpillars don’t escape. The caterpillars will attach themselves to this mesh from a silk they produce once they climb to the top to form a chrysalis. Using the hot glue gun, glue this piece of mesh on the inside of the pot over the drainage holes. The mesh should be taut, not sagging at all. Now pick a spot on the inside rim of the pot to start gluing the mesh tube around the inside circumference of the pot. Glue it tautly around the entire circumference about an inch down from the pot lip. When you get back around to the point you started, overlap the mesh by 2-4 inches. This overlap will allow you an opening to put caterpillars in and let butterflies out, but will not let the caterpillars escape or predators get in. Trim off any excess mesh inside the pot and past the overlap. Decide where you’ll be hanging this butterfly tower. It should hang so that there is extra mesh at the bottom to tuck underneath the potted milkweed so caterpillars can’t get out and predators can’t get in. Hang the butterfly tower using extension hooks if need be. Attach the embroidery hoop around the bottom of the mesh tube so it is at ground level. Be sure everything is pulled tightly, no wrinkles, and that the overlap is secure at the bottom. 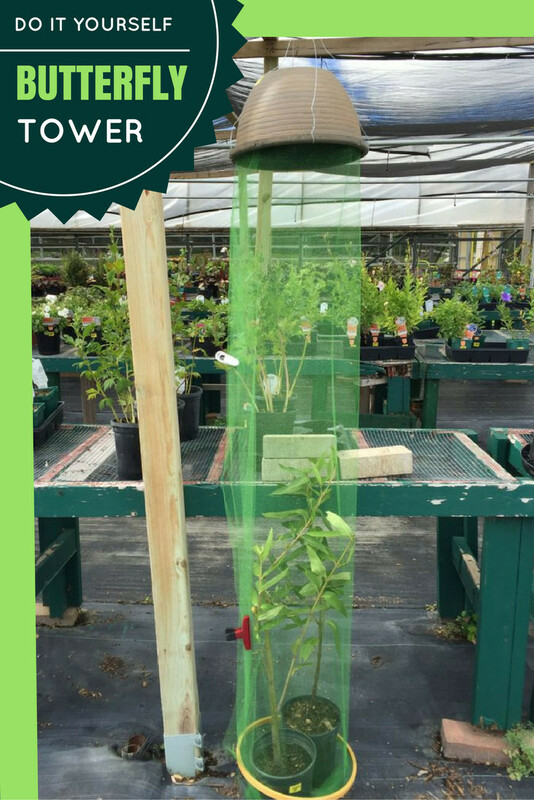 Through the overlap, place a potted milkweed inside the butterfly tower and tuck all excess mesh underneath it. Now you’re ready to hunt for monarch caterpillars and place them inside. Be sure not to collect too many that they will have to compete for milkweed leaves to eat. Check on your caterpillars daily. When watering your potted milkweed, always water the plant at the pot but first check to make sure no caterpillars have fallen into it. You don’t want to drown them. That's just an awesome idea for my chillis. Glad that you reccomend your version of the tower for outdoor. I'll soon try that on my balcony.